Bookride: The English Dance of Death. 1815. And some by fluids down the Gullet. Each malady, which men endure. 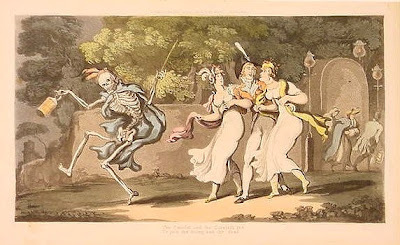 Thomas Rowlandson. THE ENGLISH DANCE OF DEATH. London : R. Ackermann, 1815. 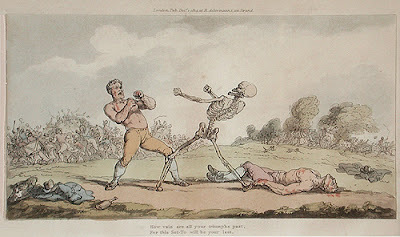 Rowlandson's work, among his best, is a jollier affair more of a satire on the follies and anomalies of his time. Gordon N. Ray claims that this work is "the only series on the subject since Holbein's to rival that master." Martin Hardie writes: "It is obvious at a glance that the artist bestowed exceptional care on the illustrations for this book. The union of the gruesome and the grotesque appealed strongly to his imagination, and in completeness of detail and carefulness of grouping the illustrations excel nearly all his other work. The hand-colouring also has been judiciously applied. Combe's versification is full of wit, and shows a force and vigour surprising in a man who had passed his allotted threescore years and ten -- a fact that adds a certain grimness to the work." Now somewhat vieux jeu but the macabre never quite goes out of fashion, nor satire and caricature. The book was occasionally making £1000+ 20 years ago and would not have been one to lay down. The only change is that now it consistently makes £1000+ especially in a decent binding and with the third volume. A copy with an original sigmed watercolour and an ink drawing and 24 extra proof plates made just over $10,000 at auction in 1995.